LAND ROVER ENTHUSIAST - SEPT '01: "Chris doesn't muck about"
PRACTICAL CLASSICS - APRIL '89: "We'd highly recommend Chris's services"
JAGUAR WORLD - SEPT '92. 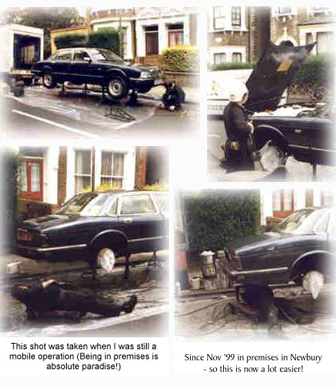 "In depth knowledge of rustproofing" We were impressed with the thoroughness of the operation" "we believe it is madness to use an older car regularly without rust protection"
CAR MECHANICS - DEC '93 "Chris uses a very high pressure water jet & seeks out every nook and cranny" "Highly efficient service"
JAGUAR WORLD - MAY '95 "So penetrative is the Steelguard that it can be seen escaping either side of a spot weld. As a demonstration Chris sprayed a little on a wet outer panel. You should see the water run" "Wheel arches are transformed from looking tired to a pleasing matt version of the outer panels. The effect is truly impressive" "Chris earns each and every one of his pennies." "I feel I must write to thank you for all your hard work and expertise that you so cheerfully put in when rustproofing my car yesterday........ I know just how filthy and tiring it can be, but to see you working in what must have been 75 degrees F for some 11 hours was nothing short of miraculous - showing complete dedication to the smallest detail. The car is really beautiful now, in fact it is a tribute to your extensive efforts of which I am well pleased. I would recommend your services to anyone who wants a thorough job done without any hesitation, in fact I use any opportunity to recommend your services whenever I "talk cars" to anyone, as well as at meetings of the Kent branch of the Jaguar Enthusiasts club. I have no doubt whatsoever that you have accumulated a very specialised knowledge of your business and, using a variety of specialised equipment, work jolly hard to give absolute satisfaction to your customers. I seriously doubt that even the most ardent D.I.Y. enthusiast could achieve even half the results that your service provides. Once again, many thanks for your hard work." Absolutely excellent in all respects; efficient, thorough and a service which was refreshingly reliable and honest. It was a pleasure to deal with you. I am only sorry I did not write to thank you earlier. Excellent work. Very highly recommended. We first used you when you were "mobile" on the MG since then you did the E-type at Greenham and we were very pleased with it. Very efficient/info pack well thought out - will recommend to all. Keep it up. Great service & excellent technically. Very pleased with the service. I will return the car for a check up in the spring. Definitely worth the money. Very satisfied and would use your services again. First Class work & service. If only all businesses were run like yours! I have enclosed an article I wrote for my local Land Rover club of which I'm a member. I had an enjoyable afternoon & evening. Everything went as planned . I have no recurring rust problems and the car appears as good as new still. I shall pass you name & service on to a friend who has just bought a low mileage XJS in case he finds any rustproofing requirements. Good job well done. Thank you! None at all as the service is very slick. The only reason full marks cannot be given is due to the amount of hidden steel work in sills and box sections in the e-type monocoque and I cannot see inside! Your service is being recommended to fellow Classic Car enthusiasts. Enthusiastic & committed to perfection. Great job Chris, all the very best for the future. I was very pleased with the service I received. Good luck & Happy New Year. In summary, I think your system is excellent & cannot be faulted. I have given your details to a number of folk - particularly Land Rover & Jaguar owners. I wish you well with all your continued developments and hope to see you in the new year. Can't really say any more, to what is an excellent job that you do, with the backup you provide. (things to do in and around Newbury) Excellent. With regards Mike. Excellent Service. Workmanship without fault. Highly recommended. Very good service, vehicle was very clean on pick up. Considering the filthy job that rustproofing is, I thought the vehicle came back remarkably clean on top. She is very happy with her waxoyl coat. Thanks!! Excellent service. We're thinking of having our other car done! I was most impressed by everything - you seem to have thought of everything and the whole service more than lived up to expectations. Thank you for your conscientious, hard work and such good arrangements. Superb. Keep up the good work Chris. I have the option to purchase another Land Rover in the near future. If I do, I will be contacting you later. Yours Sincerely. Good Service and well done. Continue to keep your high standards. Very pleased to hear you've managed to improve your premises! Regrettably, appearance & state of premises are important although I was impressed with the overall job & workmanship. Best of luck in the future! I'll come down to one of your "first" Sundays for a check-up during 2002. I was extremely satisfied. I will bring my RR back in one year or so. Very informative website. Useful information. Nice to not have to do it ourselves. Excellent level of service with skilled application of rustproofing materials. First Class - will recommend to friends. No worries. Service and car excellent. All very good. Very pleased with the work done. Many people have commented positively on the car's appearance. I was very pleased with your service and if I still have the car in 2005 I will have it treated again. - a stress free experience. Don't think you can improve on an excellent service, apart from car hire for Sunday customers. (free courtesy car now provided - Chris) Wishing you all the best for the years to come - keep up the good service. A superb service well done by a very professional person who knows exactly what he is doing; giving a peace of mind serive; Knowing your vehicle is in capable hands; Knowing it is also in safe hands. First Class job carried out with good attention to detail. Many thanks. Would use again without hesitation. Good, clean and worthwhile service. Very good job. Extremely pleased. Would use again. Very impressed. A job well done. Thank you. I was very impressed with the appontment system & Chris Parkinson's enthusiasm for what is a very dirty job. My service garage commented on how well the job had been done. I was very pleased with the quality of the service, the work was first class and I shall be back in the future.